We’re using a natural bristled brush and very intentional strokes to mimic the look of wood grain on the metal shutters. Gel staining metal shutters is an easy way to update their look and take years off an aging home. If possible, it’s usually best to remove shutters before applying a new coating to them. These metal shutters are only secured with four screws, so removal is easy. After that, we sand and clean them thoroughly. The existing paint on the shutters is too dark to work well with a “gel stain” finish so we are using spray paint to give them a lighter base color. Once the base color is dry, we can begin applying the gel stain. In this case, we’re using a natural bristled brush and very intentional strokes to mimic the look of wood grain on the metal shutters. Unlike ordinary wood stain, gel stain dries on top of the surface, rather than soaking in. That makes it ideal for projects like this where we’re trying to create the illusion of wood grain on a non-porous surface. 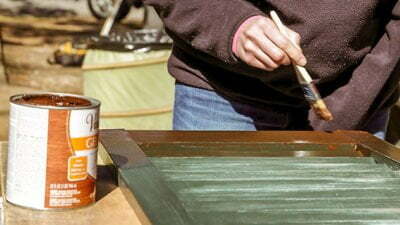 Depending on your taste, you can apply multiple coats of gel stain as the previous coat dries. Once you achieve the look you want, the new finish needs to be protected with a clear sealer like polyurethane.